Campbell’s Soup has taken a huge step forward in food transparency. Campbell’s has decided to voluntarily disclose on it’s product labels if the food contains GM ingredients. Will any pet food company be so brave and so transparent? By voluntarily labeling all of their foods to disclose the use of GMOs, Campbell’s is giving consumers what they want. The Wall Street Journal article stated “the company said it also recognizes that a Consumer Reports survey in 2014 found that 92% of Americans support GMO labeling.” Campbell’s is giving consumers what they have been asking for, and at the same time the company is choosing to publicly stand behind their products – to stand behind their belief that GMOs are safe. How very rare – a food company publicly standing behind the use of a controversial ingredient. Agree with the safety of GMOs or not, to stand behind your ingredient choices is far more transparent than fighting to hide the truth from consumers. Would a pet food ever do the same…stand behind the use of a controversial ingredient? Pet food consumers not only have GMO concerns, they have a slew of other serious issues in pet food. Pet food is called ‘food’ but only a small handful actually meet the legal requirements of food. Through loopholes provided by FDA (Compliance Policies), many pet food ingredients violate federal law (The Food, Drug and Cosmetic Act). These illegal ingredients, termed ‘feed’ (not food), are openly allowed by every U.S. state and the federal agency that is designated to enforce federal food safety law (FDA). Material allowed by FDA Compliance Policy into pet food/animal feed includes diseased animals, downer animals, chemical and pesticide contaminated foods and much more. The pet food consumer is provided with no warning or alert to the use of these feed grade ingredients on the pet food label. Consumers question the nutritional value of some feed grade ingredients, and significant controversy surrounds their safety. Would a pet food ever believe in their feed grade ingredients enough that they voluntarily label their products as ‘Cat Feed’ or ‘Dog Feed’? Would a pet food manufacturer ever believe so much in their selection of ingredients they voluntarily tell consumers it is sourced from ground alive spent laying hens? or downer/diseased livestock rejected for use in human food? Or will they fight against full transparency as the anti-GMO labeling companies have? And what about FDA? Shouldn’t FDA – who feels so strongly that diseased meat is safe for pets to consume they developed Compliance Policies allowing pet food/animal feed to violate federal law – stand behind their Compliance Policies publicly? Shouldn’t FDA provide their evidence these ingredients are safe to pet food consumers? YES! They should own it. If a company so firmly believes that feed grade is proper nutrition for cats and dogs, they should at least own that belief by telling consumers their product is ‘cat feed’ or ‘dog feed’. If a company so firmly believes that meats sourced from FDA Compliance Policy allowed diseased animals or chemical contaminated foods is quality nutrition for cats and dogs, they should own that belief too. 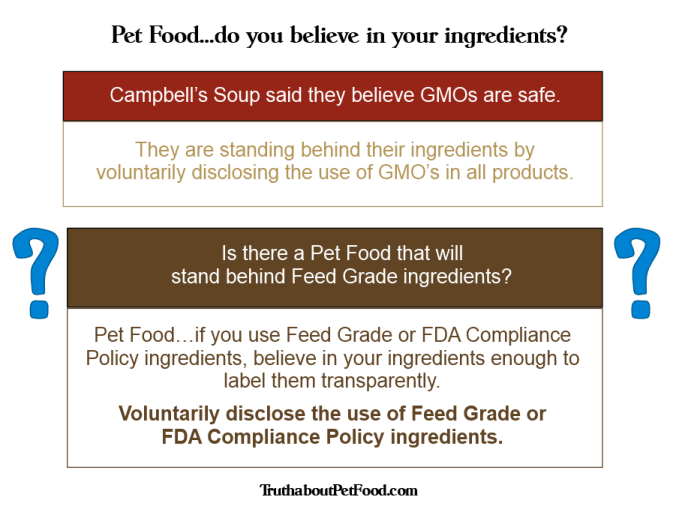 Thank you Campbell’s for standing behind your choice of ingredients in your products. Again, many don’t agree with your stance that GMOs are safe, but you did earn some respect for standing behind your belief. It’s your turn pet food…we’re waiting. Batzion, I agree! Glycophosphate is killing people & pets, & Monsanto is doing everything in its power to hide the science that proves this to be true! Regardless of the fact that Campbell’s is willing to label their foods as having GMO’s in them, all that really means is that they are not fighting the majority of public opinion. They full well know, that GMO’s are not going anywhere! So, they figure that as far as public relations are concerned, that if they are one of the first major food processors that come forward with truth in labeling, that it will earn them points with consumer’s, that is the only reason they are doing it. They full well know why they are really doing it! Sadly, many families cannot buy solely Organic food. Organic produce has gone down in cost substantially, but feeding even a small family, red meat that had been grass-fed, or poultry that the birds have only been fed Organic corn feed, is pretty hard to do, so it is almost impossible to keep all these toxic chemicals out of families bodies. It is a real challenge today to raise a human family, nevertheless the furry family members! Especially if we (myself included) have many fur-babies. As a animal rescuer, it becomes very challenging trying to find adopters that will be open -minded to understanding why they need to spend a lot of money on quality food & also not continue to vaccinate ongoing. I wish Susan could help with some kind of forum to bring together enlightened rescuers, like myself, & enlightened adopters. That would truly be a helpful resource! Yay for Campbell’s!! All it will take is one major pet food company to start the Ball rolling!! Susan and Cheryl, I just received this excellent article titled “Drugging Animals on Factory Farms—ENOUGH Already” by Katherine Paul of the Organic Consumers Association regarding Elanco, the $2.3-billion animal drug division of Eli Lilly. I noticed I misspelled “glyphosate” twice in my previous post. WTG Batzion.